A box of Belgian Chocolates and quality French Champagne presented in wooden gift box. Ideal to give as a wine gift and a popular Business Champagne Gift and chocolate set..
Montaudon Champagne, please note brand of champagne may change but not the quality. Belgian Chocolates - assorted box of Belgian Chocolates. May contain nuts. 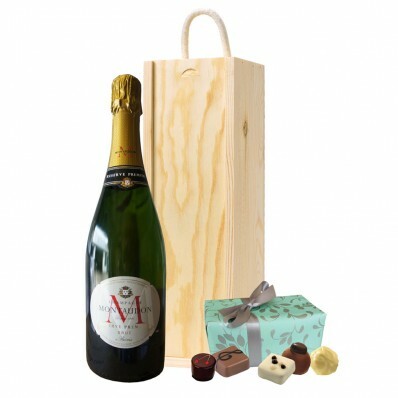 To personalise this champagne and chocolates gift set we can apply an engraved brass plaque to the box. Prices start from £12.50 depending on the engraving.